It's not the first time we visited the area, we were a couple of years ago tasting Pinot Noir and Sauvignon Blanc (and many others), so we decided to go back to get some wine for out home cellar. This time we tried to integrate the wineries we had already visited with some new ones and we had some pleasant suprises. Since most wineries are closed on Sundays we had to move fast to make the most out of our day and a half of wine tasting. So, with the "Bible" (the Italian sommeliers' guide) in hand and the map in our smartphones, let the tour begin! This is one of the new ones, it is located in Montagna, near the exit of the A22 highway. It is a relatively big and well-known winery, the highlight of the shop/tasting point is its furniture made of cork and the exhibiton of its labels, all created by a local painter. We were interested in their Pinot Noir Schweizer and the Moscato Rosa (sweet), both had the highest points in the guide. Both were good wines but we were more impressed by the Manna, a blend of Riesling, Gewürztraminer, Chardonnay and Sauvignon, which was extremely fragrant and fresh and a good Gewürztraminer (Traminer) with a correct price. The Schweizer was good, but its price was a bit too high, in our opinion. Another new winery in our list. We were told about it since it is not on the Sommelier guide. The winery and shop are in a super-modern building over (literally over) the vineyards, a nice space to taste the different wines of this producer overlooking the amazing panorama. The wines are good, nothing super special but good, especially the Gewürztraminer Caldiff. Another new winery, not in the guide. 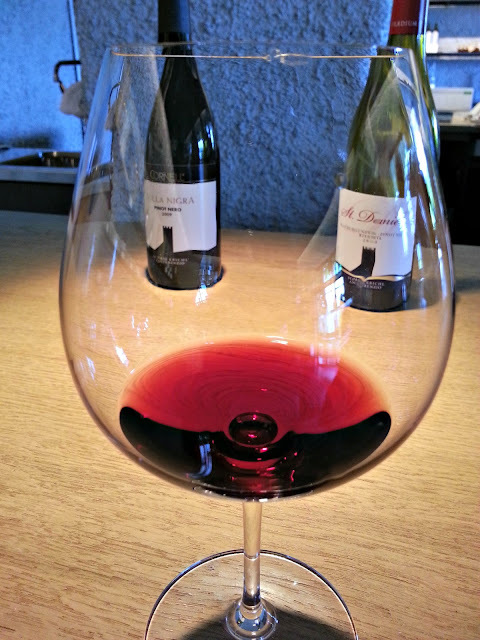 This one was the hidden gem we were expecting, a small, family-run winery in Ora, they focus on red wines and they produce an excellent Pinot Noir called Filari di Mazzon and a good Lagrein called Di Ora in Ora. After 3 new wineries we needed something more familiar so we went to have our last tasting of the day at Erste & Neue, which we had visited a couple of years ago. We remembered their excellent whites and we were not disappointed, neither by the top-class Puntay Gewürztraminer and Puntay Sauvignon nor by reds like the Mezzan Pinot Noir. The shops serves also as a bar for locals (mostly older men). After 4 wineries and about 18 wines tasted we decided it was time for dinner at Ansitz Pillhof.